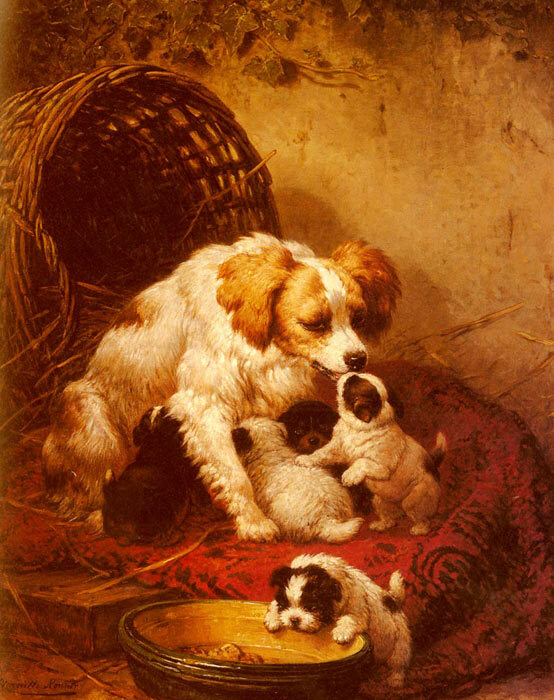 Initially Ronner-Knip studied under her father, the landscape artist Joseph August Knip (1777-1847) and from the first, Henriette Ronner-Knip applied herself to exclusively paint animals, in particular dogs and cats. Her appeal and patronage was international, and Spielmann, her biographer identifies the core of her popularity as the fact that she was the first painter in the history of art to master the elusive nature of the cat and dog, in all of their moods and capture it on canvas -The Happy Family, Teatime For Kittens, High Tea. Ronner-Knip paintings are in several public collections, not least the Rijksmuseum in Amsterdam. SPECIAL NOTE : The painter will make the reproduction as close to the original oil painting as possible. If you want your painting to alter from this likeness, please email us and " The Happy Family " will be reproduced according to your special requirements.